In social media marketing, especially when you are new to the game and your audience still small, one very important goal is to get other people to share your content to their audience. When your audience is still small, you depend on others to help you reach a larger audience by putting your content in front of their audience. Knowing this you should take every effort you can to make sharing your content as easy and enjoyable as possible. 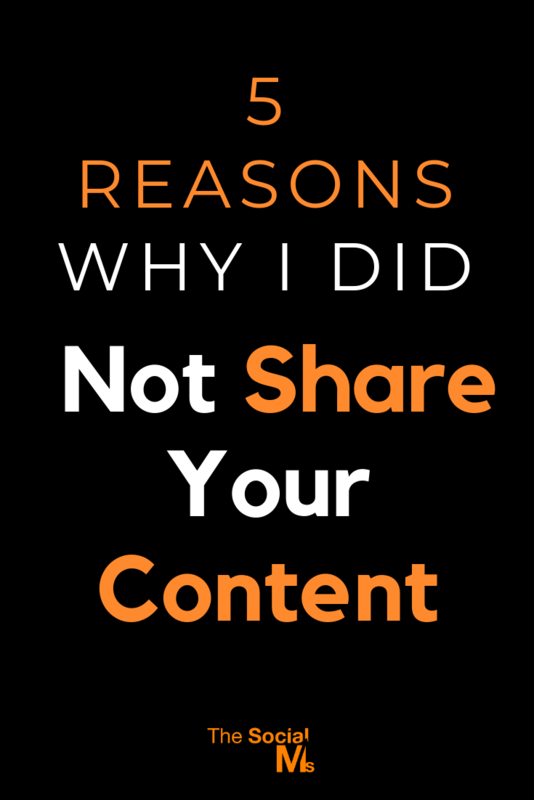 If no one is sharing your content, step back and take a look at your blog and ask yourself: would you share your content? This said I am rather speechless at how often bloggers make it so hard for me to share their content and how clumsy their efforts often are with which they attempt to lure me into taking action. 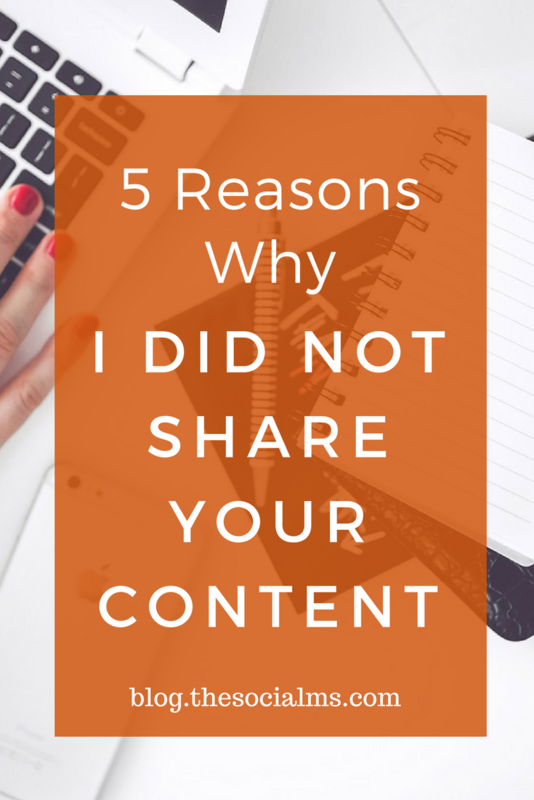 And in the end, more often than not I did not share your content for rather mundane reasons. 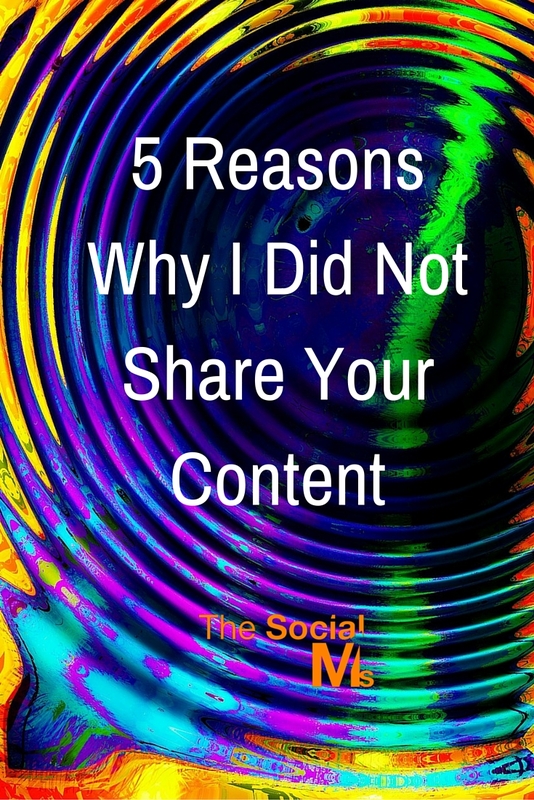 Of course, the most straight forward reason why I did not share your content is that either I simply did not like your content or your content is entirely uninteresting to my social audience. I have basically two ways of discovering blogs which I read and then share what I like. I have a couple of blogs I visit regularly and browse through their latest articles. Everything else I share is chance findings in my social networks. Some posts I find on Twitter, some on Facebook or Pinterest. If you are not already on my regular browsing list you should definitely be on social media if you want me to share your content. The most prominent reason why I (and everybody else) did not share your content is that I did not know your blog exists. Before you can expect me or anyone else to share your content you have to make me aware of it. So the truth is: you need to start with sharing and distributing your content yourself. Your job as a (young) blogger is not done with publishing your content. Before you can expect others to share your content, you have to share it yourself and get your content out there. Sharing your content means I trust you enough to share your opinion with my audience. And in order to do so, I want to know who you are. Again and again, I am surprised at how many people contact me for various reasons and do not bother to tell me who they are. Believe it or not, sharing your content is a kind of recommendation. That is one reason why famous people and influencers get so many shares. Because people know who they are, they trust them and they trust their content. Not knowing you and not being able to find out easily who you are, may well result in me not sharing your content – even if your content did speak to me and would have been interesting to my audience. Make sure you have some easy to find information about yourself on your blog. Yes, I know, writing the perfect headline is a science. And I know even our headlines could sometimes be better. But between the perfect headline and a headline that stops people from sharing your content there is a long way to go. I have seen articles simply titled “Social Media Marketing” – sorry, do you really think that headline works? I know it does not, and so I won’t bother my audience with it. A headline has to give some hint at what to expect in the content and it has to attract attention. In most social networks, the headline is more or less the only information people get before they click on the link (or do not click). A totally boring and uninteresting headline will kill your chance of getting shares. Also, if your headline has nothing to do with your actual content, that will keep me from sharing, too. Do not try to deceive me or your audience with a catchy headline your post does not connect to. You may try to deceive me, I certainly do not want to play that game with my audience. The other mistake is to write headlines, which are too long. I am very active on Twitter. A headline which is too long for tweeting and expects me to use my brain on how to shorten it so that it fits a tweet is definitely too much to ask for. Headlines need to fulfill some basic criteria and that is: They have to make sharing easy. They have to make people curious about the actual post and hint at what to expect. Sometimes I am rather shocked at how many “marketers” do not have any share buttons on their blog. Yes, that is a more widespread problem than one would expect. And if you really think your blog posts are so great that everyone is wanting to share them so much, that they actually take the time to copy and paste link, headline and maybe even your Twitter handle into their Twitter – think again. If you want people to share your content, make it as easy for them as possible. Share buttons on your blog is not an add-on it is a must. And you need to make sure that the share buttons provide a ready to share social media post. I have seen share buttons, which gave me an empty tweet – in that case, you can forget the share buttons, they are no use anyway. Make sure you not only have share buttons, make them easy to find, too. I, as a new reader to your blog, need to be able to find them at first glance. If I have to hunt down your tiny and well-hidden share buttons, chances are high, that I lose interest before I find (and use) them. There are many social networks that work only or at least better with pictures. It is no secret that Facebook gives link-updates with pictures more reach than the updates with no picture or a picture in the wrong format. It is also no secret that many bloggers drive a hell of a lot of traffic from Pinterest – but Pinterest needs images and again these images need to fulfill certain criteria. Of course you cannot provide an image for each and every network in the ideal format. But the networks that you yourself identified as the best for your purpose should be considered. 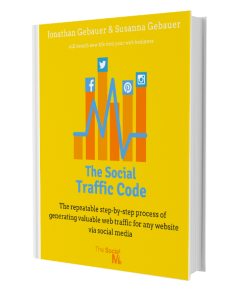 If you want traffic from Facebook, create a picture in the right format. If you want traffic from Pinterest, read some articles on what kind of images work on Pinterest and create some images for your own blogposts. Even on Twitter, you get more visibility if your tweets have images, but it is not a must to have a picture to get people to tweet. However, for Facebook and Pinterest having no pictures, which will work there, will certainly result in no shares – and no traffic. There is a lot of advice out there on how to get more shares for your blog posts including tips on how to get in touch via email and asking for shares. But before you turn to the more difficult forms of gaining shares, make sure you get it right on your end. You can spend a lot of time building relationships and connect with people, if you do not provide shareable content, you will not succeed.